By Irfan in Web Design. Updated on April 24, 2018 . Typography contributes to the reading experience of a site, which is why web designers spend a lot of their time finding great fonts that will suit their website’s design. Applying custom font on your web page requires several steps. We pick a font, then convert it to a Web-compatible format, and then add it into the style-rules. It’s far from effective, especially when you have to repeat the process multiple times, with multiple fonts. Here is an alternative: Font Dragr. 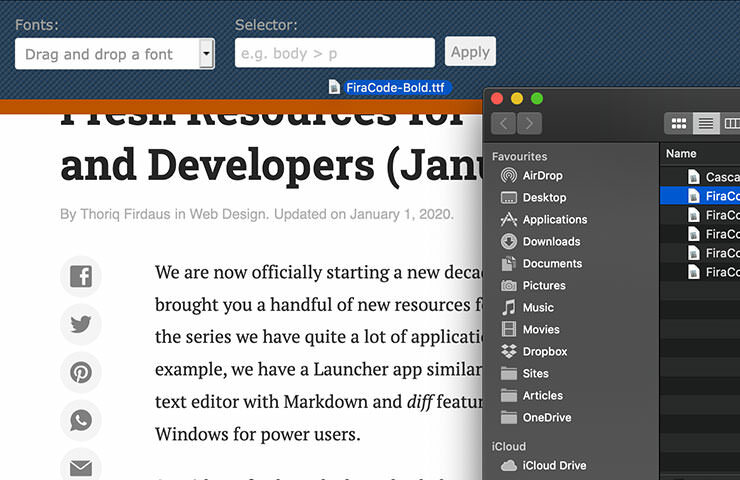 Font Dragr offers a new revolutionary way to test fonts on browsers. Simply drag the font from your font collection onto the page, and the font on that page will automatically change to the chosen font. Let’s check it out. 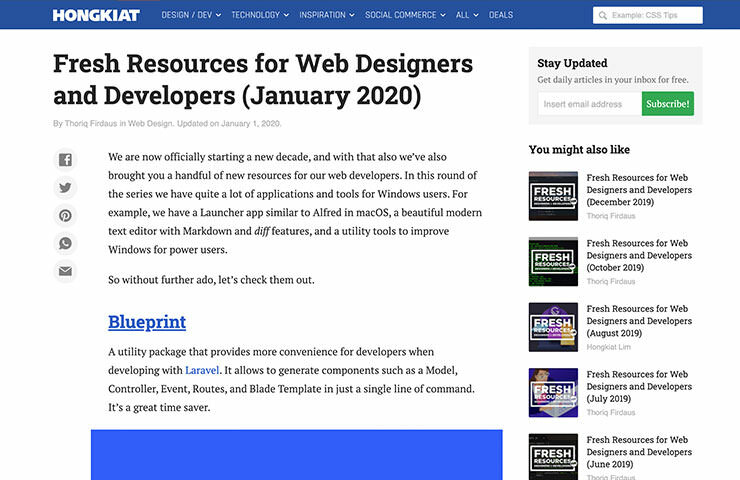 Font Dragr is developed by Ryan Seddon using the @font-face rule, HTML5 Drag-n-Drop API, and also offline access applicationCache, which allows us to use it without the Internet connection after an initial visit. 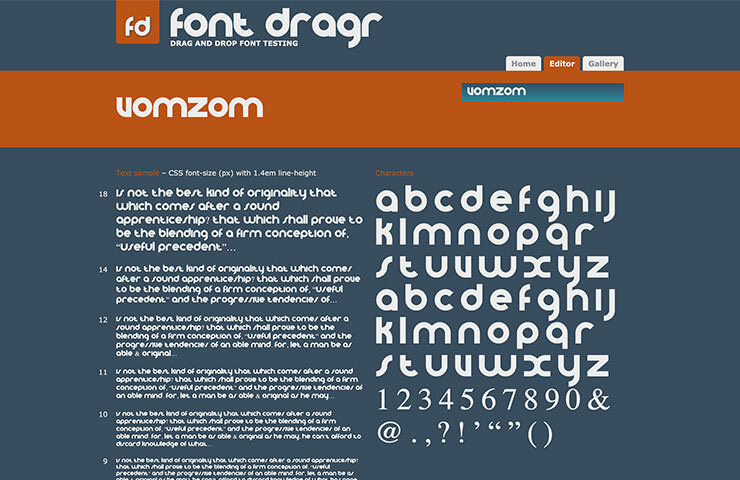 Visit FontDragr, then drag n drop your font anywhere on the page. You will find two tabs: Editor and Gallery tab. The text on the page is fully editable so you can test any text you want. If you need some fonts to experiment on, you can grab any of the 9 listed in theGallery page to experiment with. Alternatively, there is the bookmarklet to use. Just drag the bookmarklet to your bookmark bar, then click on it while on a web page you want to test. Let’s demo this with hongkiat.com. The following screenshot is the site before we take action. After clicking the bookmarklet, a header will show up (see below). In the Selector textbox, you can specify the HTML elements you want to test your font on. The default selector is p tag, but you can test out body, h1, h2 etc. 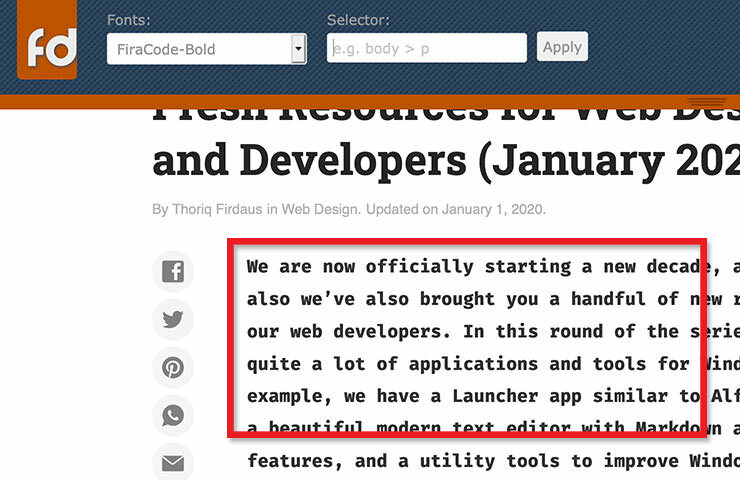 Then, drag and drop your font to the FontDragr header. The text that is affected will automatically change to reflect the font you chose to test. In this shot below, the font that has changed is marked with the red box. The bookmarklet, unfortunately, does not work on Facebook and all sites with HTTPS protocol. Plus, the header that shows up can only be hidden or removed if you reload the web page. 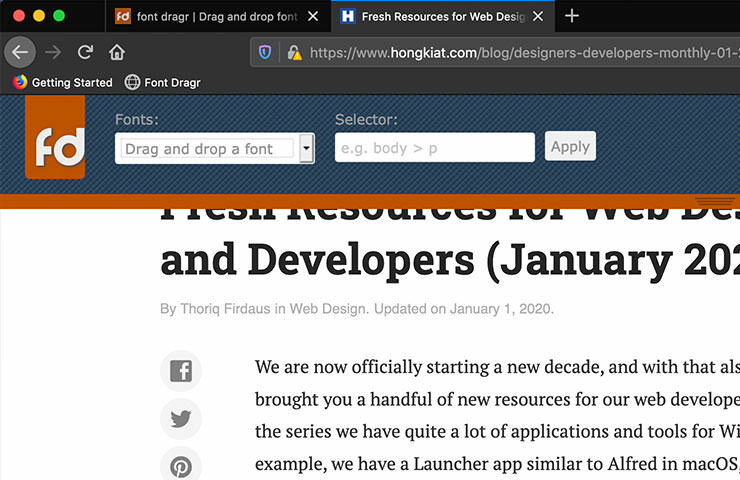 In addition, the drag-and-drop feature seems to only work well in Firefox 3.6+ and Chrome. If you ever used other similar webfont services like FontFonter, FontFriend, Web Fonts Preview or FontPrep (for Mac only), you will probably find Font Dragr the most complete and easiest to use. But don’t take our word for it, try it out and leave us a comment on how the app worked (or not) for you.